Plan a 3-day tasting tour of breweries and craft beer spots in Asheville, Charlotte and the Triangle. If you’re a connoisseur of craft beers, consider the facts: North Carolina is home to more than 260 local breweries (more than any other state in the South), celebrates its own Beer Month and has a city voted “Beer City USA” for four straight years. Our state just might be your “brewtopia,” which makes it ideal for a 3-day tasting tour to cities where the beer scene is a significant part of local culture. Asheville has been the recipient of many interesting recognitions and top rankings, including being voted one of the happiest places in America and “Beer City USA” for four consecutive years – a combination the local brewing community might try to convince you makes perfect sense. Prepare for your brew tour with a robust breakfast or brunch at Early Girl Eatery or Over Easy Café. Then consider a stop at Bruisin’ Ales to get you in the beer mood and maybe pick up some unique treats to take home. This locally owned shop, consistently rated as one of the top beer retailers in the country, generally has more than 1,000 beers on the shelves. Head over to Thirsty Monk, where constantly rotating taps offer local and American craft beers upstairs, while the downstairs bar is devoted to traditional Belgians. Across the street is Jack of the Wood, a Celtic-style pub that offers its own Green Man English-style ales and a menu of other beers. Be sure to ask what’s on cask. Head down Coxe Avenue to the South Slope and you’ll uncover a plethora of breweries in the area producing a range of styles, from creative originals at Burial Beer and Twin Leaf to the imaginative sours at Wicked Weed’s Funkatorium. If hunger strikes, a good location to find a food truck as well as some tasty beverages is Wedge Brewing Company in Asheville’s River Arts District, where you can sit outside by the French Broad River and sip a beer concocted just steps away. Or if you’re interested in not just tasting but learning more about the brewing process, you can get behind-the-scenes access with a “brews cruise,” offered by several local operators. Charlotte has made its name as one of the rising cities of the “New South,” with a fast-paced Uptown scene complemented by sedate older neighborhoods and rural suburbs. 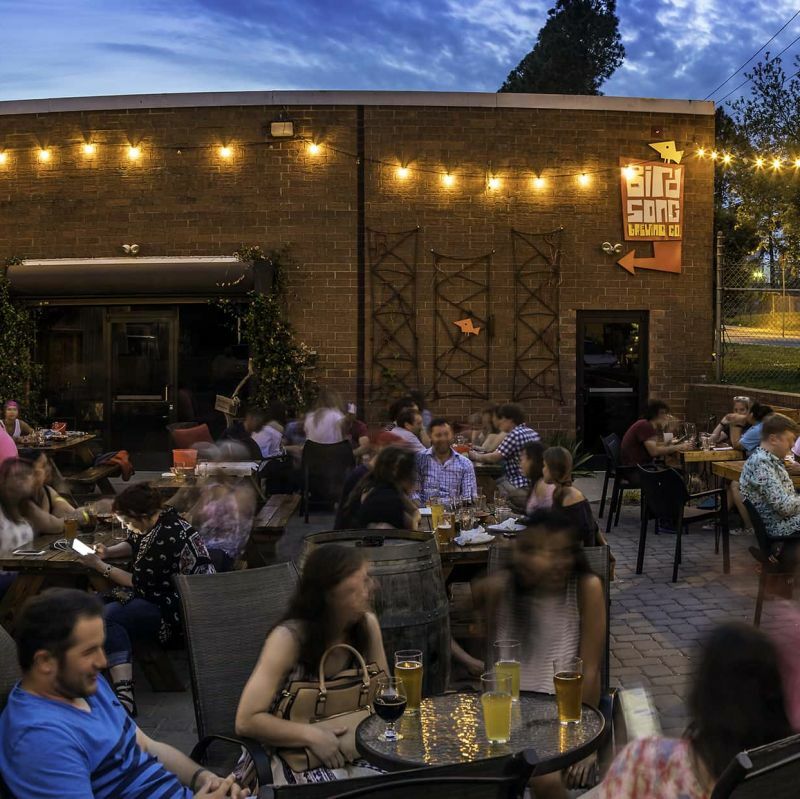 But in such trendy settings as the NoDa arts district, South End and Dilworth, local brewers have proven the Queen City is no slouch when it comes to concocting craft beers with an urban edge. 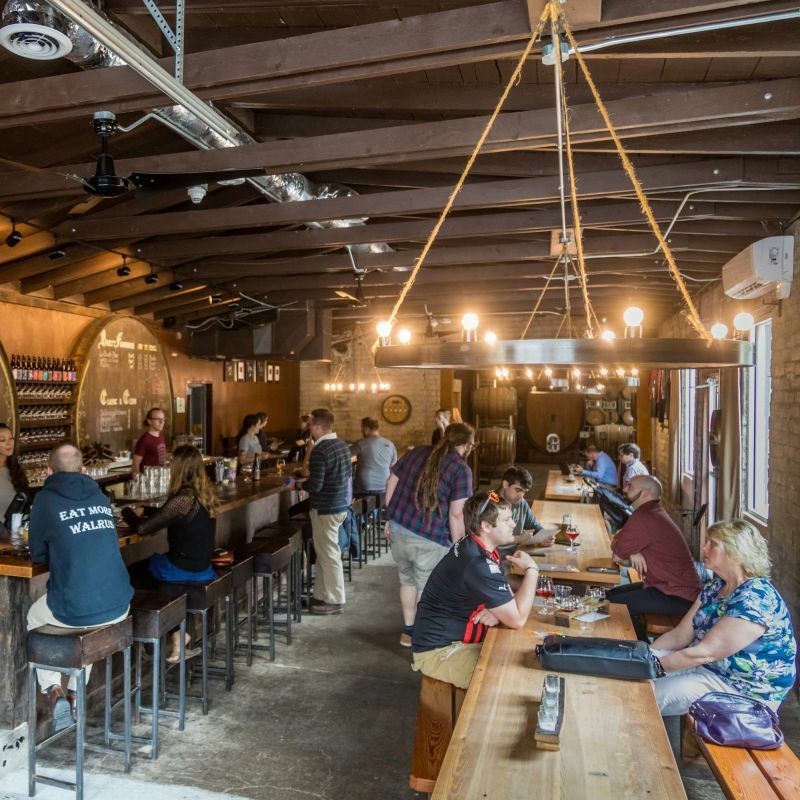 Once a mill town now evolved into an arts and entertainment district, the NoDa neighborhood is the ideal setting for a brewery that creates small-batch premium beers, and is aptly named NoDa Brewing Company. Find a place in the tap room and try out the variety of brews within view of the production floor. Other breweries in the area that have grown to become major players are Free Range Brewing, which prefers to offer a constant rotation of new beers; and Birdsong Brewing Company (down the street from NoDa), where the Jalapeño Pale Ale is a surprising delight. NoDa’s restaurants and shops are always alive with activity, including live music at Neighborhood Theatre and Evening Muse. Check out Growlers Pourhouse, where the operating recipe is “Craft Beer & Beer Food.” Rated one of the country’s top beer bars by Draft Magazine, Growlers has a refurbished 1936 beer engine that serves up hand-pumped cask ales and a food menu designed to pair with beer. From Uptown or in historic South End, hop on Charlotte’s light rail train and then head off for a visit to Triple C Brewing Co. The location explains the Light Rail Pale Ale among the brews on the menu, which also features the popular Baby Maker Double IPA. The spacious taproom, with its exposed brick walls and wood roof, is a favorite local gathering spot where dogs are also welcomed. A little farther down the light rail line in the warehouse district is Olde Mecklenburg Brewery. Its authentic German-style biergarten is the perfect spot to kick back and sample a formidable lineup of fresh beers from the city’s first brewery. The emphasis is on seasonal beers made from quality ingredients that comply strictly with the German Beer Purity Law of 1516. If you want to take along some of the brews you’ve uncovered, check out Good Bottle Co. and its extensive selection of local, regional and national craft beers. Durham’s recognition for food and drink includes a healthy craft brewing culture. A perfect representative of this evolution is Bull City Burger and Brewery, with its farm-to-fork approach to food and a brewery putting out fresh ales and lagers seasonally. Of course, as the name implies, the build-your-own burgers are local favorites, while the dirty fries draw rave reviews. 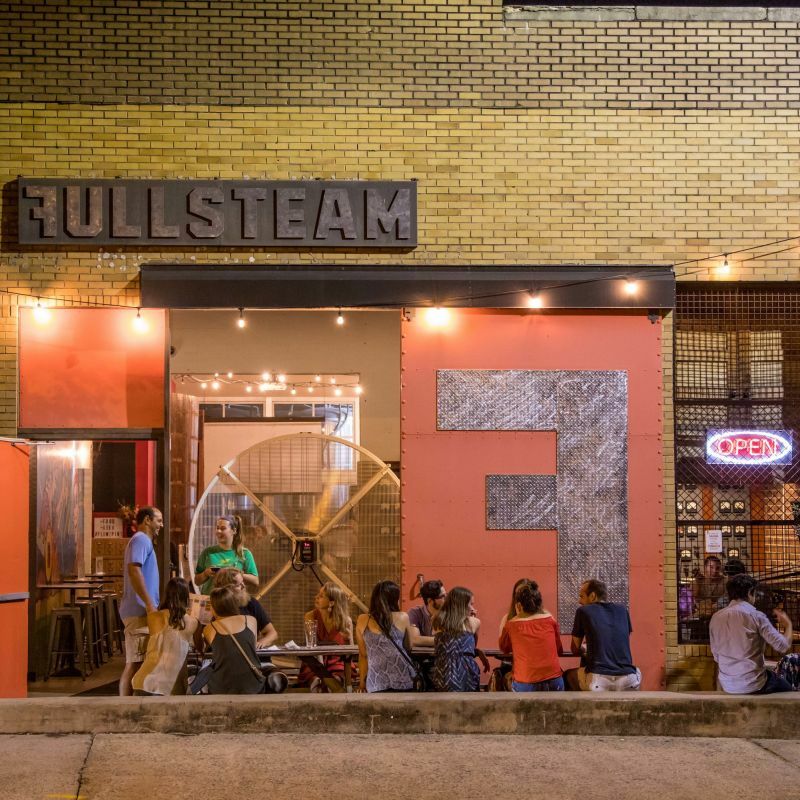 Fullsteam Brewery is another Durham brewery that uses local hand-harvested ingredients and heirloom grains, while also collaborating with local chefs and musicians to craft unique custom beverages. Next door is Motorco Music Hall, a creative reuse of a former car dealership that houses Durham’s largest music venue, a restaurant and bar, and a huge outdoor patio. The state capital of Raleigh has become a hotbed of craft brewing in recent years, with more than a dozen breweries within city limits (and about another 15 combined in the small adjoining towns). Raleigh Brewing Company not only turns out a line of well-crafted beers, but it also distinguishes itself as the first female-owned brewery in North Carolina. Shop for favorites and discover new brews at Tasty Beverage Company, where you’ll find more than a thousand packaged beers and a few on tap. The emphasis is on local, craft and specialty beers from around the world. Another great way to explore the Triangle beer scene is with a Beltline Brew Tour. These private, guided tours provide special access to selected breweries and opportunities to sample the craft beers being produced. Please drink responsibly and travel safely while visiting North Carolina breweries and festivals.